The Black Hills Plein Air Paint-Out gathers artists in the Black Hills of South Dakota to paint the beautiful Black Hills on the last weekend of September. Custer State Park’s famous annual buffalo round-up. Horse Memorial, prairie, meadows, aspens, lakes, streams, wildlife, the Mickelson Trail, and history. 1. This is an open event. 3. Entry fee: $60. Fees are non-refundable and non-transferrable. 4. All paintings must be painted “en plein air” in the Black Hills of South Dakota and completed during the dates of the event. Artwork must be completed outdoors in front of the subject depicted in the work. Work not completed outdoors and in front of the subject depicted will not be hung. Paintings completed prior to this event are not permitted. 5. The roster of participating artists will be filled in the order registration forms and fees are received. 6. Entrance to Custer State Park requires a park entrance fee. A temporary 7-day pass is $20 per vehicle, obtained at any of the park entrances. A park entrance fee is not required the day of the Buffalo Roundup. 7. Blank canvas panels must be stamped at artists’ check-in. The canvas must be blank but may be tinted. The stamp must be visible on the backs of the finished painting when framed. 8. Canvases/papers must be free of images prior to stamping…no false fronts, no digital prints to be painted over. No paintings from photographs, no entries produced using manipulated photographic processes, computer enhanced imagery, or other nonplein air methods will be permitted. 9. No “gallery wrap” canvasses are permitted. (Wet paint on the edges makes for difficult handling.) No sawtooth hangers or “eye” screws allowed. All paintings must be properly framed with D-rings with a wire on the back of the painting. Work that does not meet these standards will not be hung. 10. Papers for watercolor, pastel, and other drawing mediums must also be stamped at artists’ check-in. Stamping must be visible when artists bring their finished work to be hung at the venue. Works on paper can be loosely framed so the backs of the papers can easily be checked for proof of stamping. Then the artist can complete the framing. …… Or……the paper can be mounted on rigid supports before artists’ check-in and stamping. The stamp would then be easily visible when the finished work is hung at the venue with less disruption of framing. 11. Paintings completed during the event will be offered for sale to the general public beginning Thursday, Sept. 26, at 8am until Saturday at 4pm at the venue — the Hill City Senior Center, 227 Walnut Avenue, Hill City, SD, across the highway from the 1880 Train. Artists are encouraged to begin checking in their paintings for hanging at the venue beginning at 8am on Thursday. 12. Each artist is assigned a panel space, measuring 48″ x 80″, on which his/her paintings will be hung. 13. Artists receive 70% of the selling prices of their paintings that sell at both the wet sale and the quick draw auction. The Black Hills Plein Air Paint Out receives 30% from sales from the wet sale. 30% of the selling prices of quick draw auction paintings sold will be donated to the Hill City Boys and Girls Club for art-related activities and supplies. 14. Sales are handled by the BHPAPO cashiers at the sales venue and not the artist. If a buyer purchases artwork off the easel at the time of painting, the artist must notify BHPAPO of the transaction and give said payment to the BHPAPO cashier for proper accounting and disbursement. Artwork sold off the easel is not eligible for award consideration. 15. Paintings considered for awards need to remain at the venue for judging on Friday afternoon, Sept. 27. 16. Nocturnes can be painted the evenings of Wednesday and Thursday in any Black Hills location. An artist may paint as many nocturnes as he/she wishes, but only one may submitted for Best Nocturne judging. 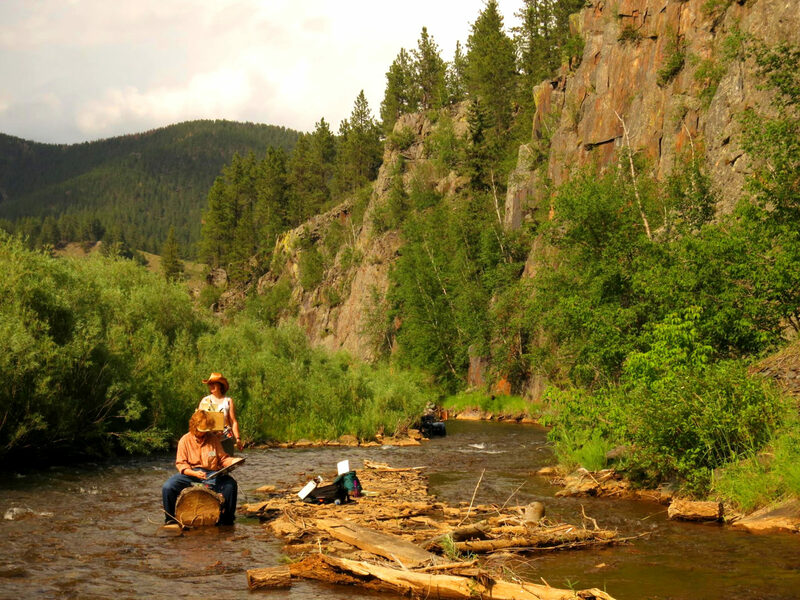 Event rules governing plein air painting and framing apply. Nocturnes need to be checked in by 3pm Friday for judging. 1. Paintings need to be checked in by 3 pm, Friday, Sept. 27, at the Senior Center, to be judged for awards. Artists can continue to paint. Any event paintings completed after that time can be hung Saturday morning for any possible Saturday sales and are not eligible for awards. 2. The People’s Choice award is given to the painting receiving the highest vote tally from all attending the Artists’ Reception. The awards for Best of Show, Honorable Mention, Best Nocturne, and Best Quick Draw will be chosen by the juror. The Best Quick Draw award will be determined by a juror Saturday following the Quick Draw. 3. The same painting cannot receive two event awards…only one event award per painting. 4. Nocturnes will hang on a separate panel for judging. Again, an artist may paint as many nocturnes as one wishes, but only one nocturne per artist may be submitted for Best Nocturne judging. 5. Purchase Awards: Purchase Award Sponsors will be invited to select their paintings to purchase at a private late Friday afternoon viewing after the jurying and before the artists’ reception and awards presentation. 6. A purchase award is for ownership, so the same painting could win an event award and also be selected for a purchase award. 1. 8am to 5pm: registered artists’ check-in and panel stamping at Inside/Out at 150 Poplar St., located near the south end of the 1880 Train property near a stop on the Mickelson Trail in Hill City. 2. Blank panels/surfaces must be stamped. They may be tinted. Refer to Guidelines #7, #8, #9, and #10. 3. Receive your artist’s registration packet and ditty bags containing information, name tag, painting price tags, and suggested sites to paint. 5. All artwork completed needs to kept in the possession of each artist until 8am on Thursday. 6. ARTISTS’ MEET AND GREET at Inside Out Gallery from 5 – 7pm. 7. Nocturne painting time in the Black Hills! 1. Artists check-in and registration continues at Hill City Senior Center at 227 Walnut Ave., across the highway from the 1880 Train. 2. 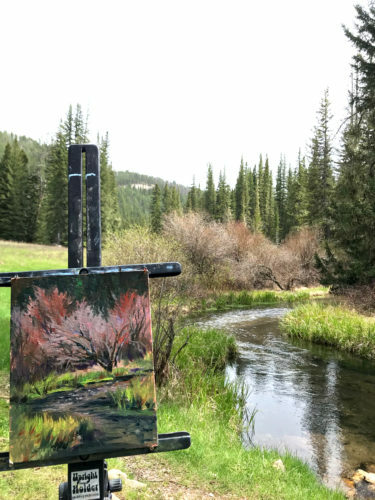 Free painting day in the Black Hills. 4. Gallery Talk: 7pm at Warrior’s Work – Ben West Gallery, downtown Hill City. 5. Artists are on their own for the evening meal. 6. 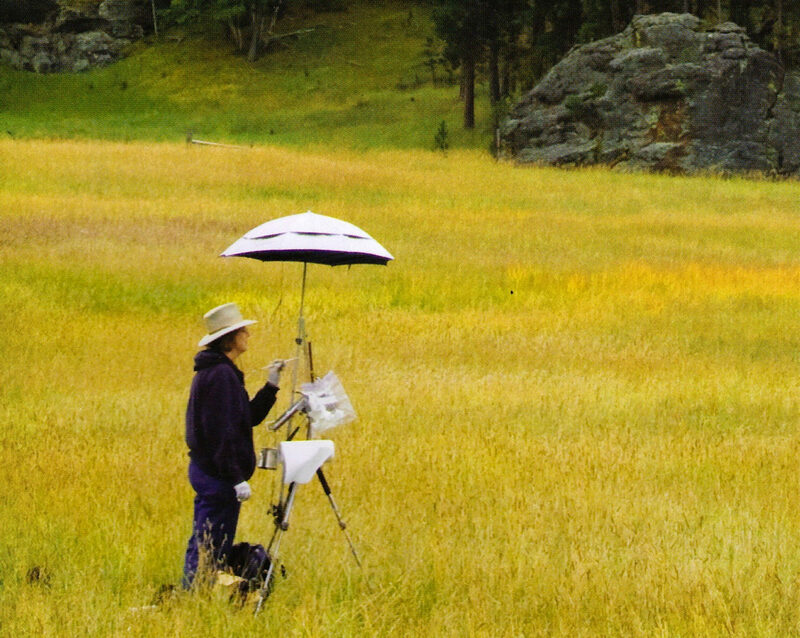 Painting in Custer State Park is usually problem-free. However, a few cautions! A. The wild burros love open car windows for free snacks. Painting near them could be a challenge. B. Buffalo should not to be ignored. Painting near any buffalo is best done within the safety of your vehicle. They are dangerous, period. C. The Needles Highway is narrow and crowded. It is a great place for granite vistas. Cautious driving is advised. 1. The Hill City Gallery Walk starts at 5pm Thursday and is open to the public. 2. The walk will include the following establishments: Warrior’s Work and Ben West Gallery, Dakota Art & Nature Gallery, ArtForms Gallery, insideOut Gallery, Jon Crane Gallery and Framing, Jewel of the West, and Stage Stop Leather & Gifts. 3. Artists are encouraged but not required to paint a nocturne of downtown Hill City during the Gallery Walk. Friday, Sept. 27: Free Painting Day, the Buffalo Roundup, and Artists’ Reception and Awards! 1. Paintings must be checked in by 3pm to be considered for awards. The check-in process takes about 5-10 minutes, so plan accordingly. See #2. 2. The Hill City Senior Center venue will be closed to artists and the public for jurying from 3 to 6:30pm. 3. Purchase Award Sponsors are allowed a private early viewing from 5-6:30pm to make their selections. 4. Artists’ Reception and Awards is from 6:30-8:30pm and is open to the public. 5. Ballots for the People’s Choice award will be distributed among those attending the Artists’ Reception on Friday evening. Balloting will end at 7:15pm. 6. Awards will be presented at 7:30pm. 7. Awards include $500 Best of Show, $250 People’s Choice, $250 Honorable Mention, Best Nocturne $100. The $100 Best Quick Draw will be awarded Saturday following the Quick Draw. Artists can win both an event award and a purchase award for the same painting. 8. Hors d’oeuvres and beverages will be served. Friday, September 27, 2019 is the day of the annual Custer State Park Buffalo Roundup. The Roundup is part of Custer State Park’s management plan to maintain a healthy balance between the number of bison, based on the condition of the grassland and how much food is available. It also allows for some of the buffs to be sorted out of the herd and then sold at an auction in November. The viewing area for the roundup is located on the Wildlife Loop Road in Custer State Park. The Wildlife Loop Road begins near the east end of the State Game Lodge campground and heads south. Parking lots at the north and south viewing areas open at 6:15am. Be prepared for traffic. If you are in the park by 7am, you will have plenty of time to get to the viewing areas. The roundup does not start until 9:30am. Pancakes, sausages, and beverages are available beginning at 6:15am at both viewing areas, as well as the provisions of the necessary facilities. You may want to bring layered clothing, folding chairs, binoculars, snacks, drinks, as well as your paints. Shuttles are available after the Roundup for those who wish to go down to the corral area. The Roundup is over by 11:30am, but visitors need to be prepared to stay in the viewing areas until the bison are across the Loop Road and safely in the corrals. Large traffic jams are common. Time driving from the roundup grounds to Hill City can take at least 2 hours via US-16E and US-385N, through the town of Custer. 1. Surfaces for the Quick Draw need to be stamped at the Senior Center from 8am-9am. 3. Best Quick Draw Award ($100), chosen by a juror, is announced at 12 noon. 4. The auction of Quick Draw pieces begins immediately following the announcement of the Quick Draw award. The auction is open to the public. 5. Proceeds from quick draw are distributed as follows: the artist is paid 70% of the selling price of the painting and 30% will be donated to the Hill City Club for Boys and Girls for art related activities. 6. All paintings will continue to be available for sale throughout the day on Saturday from 8:00 am to 4:00 pm at the Senior Center. 7. Artists need to check out all unsold pieces by 4pm. 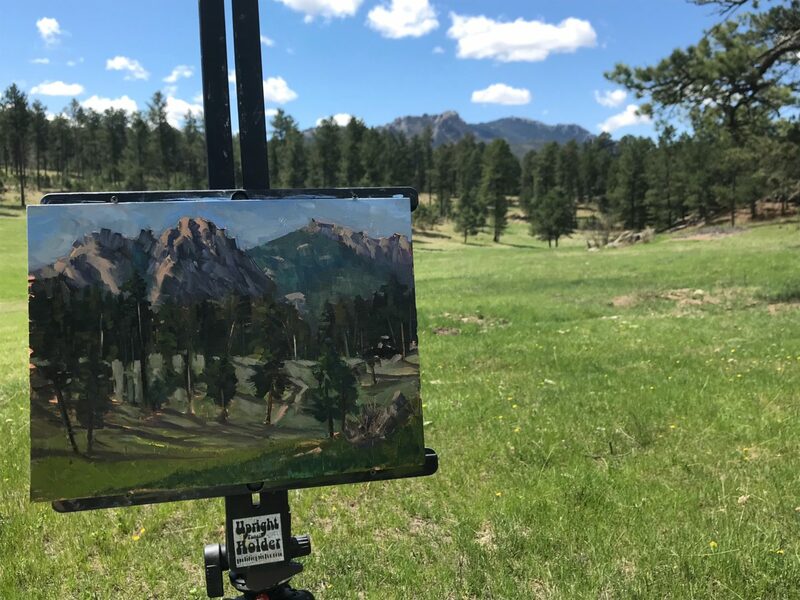 ENTRY INSTRUCTIONS: Download the Prospectus and REGISTRATION FORM for the 2019 BLACK HILLS PLEIN AIR PAINT-OUT at the top of this web page.